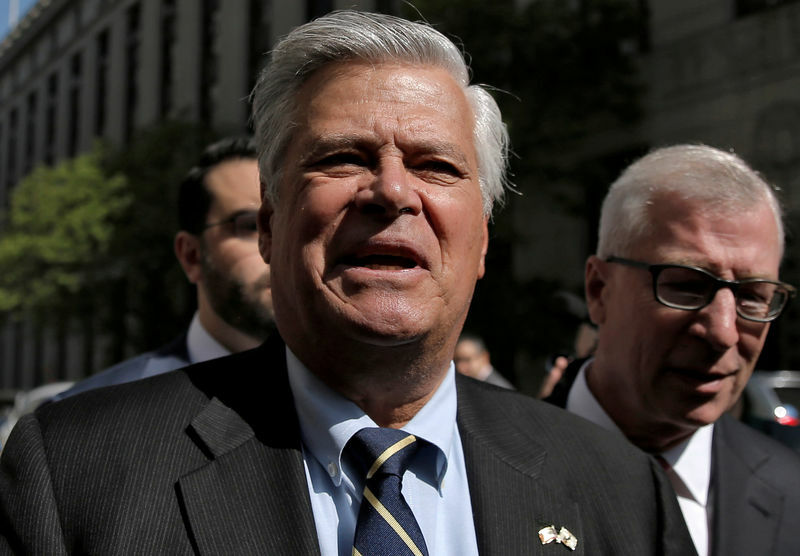 NEW YORK (Reuters) – A federal judge let stand a corruption indictment against former New York State Senate majority leader Dean Skelos and his son Adam, and refused to move next week’s retrial out of state despite their claim it would be too hard to find an impartial jury. In a decision made public on Monday, U.S. District Judge Kimba Wood in Manhattan rejected claims that a recent U.S. Supreme Court decision narrowing the definition of corruption tainted the government’s extortion and bribery case. Wood said it was enough that prosecutors alleged that Dean Skelos “took some official action or actions” in exchange for payments for his son, but that they did not have to occur simultaneously. In refusing to move their retrial, Wood found it “likely” a fair jury could be seated in New York, downplaying the Skeloses’ concerns that pretrial publicity had “poisoned” the jury pool and left them “generally presumed” guilty there. “Many courts have noted that large metropolitan districts have jury pools so large and diverse that finding untainted jurors is easier than in smaller or more insular districts,” Wood wrote. Lawyers for the Skeloses did not immediately respond to requests for comment. A spokesman for U.S. Attorney Geoffrey Berman in Manhattan declined to comment. Jury selection begins on June 19. Prosecutors accused Dean Skelos, a Long Island Republican, of using his position as Senate majority leader to pressure three companies to provide his son with consulting work, a “no-show” job and a $20,000 payment. The Skeloses were convicted in December 2015. Wood later sentenced Dean Skelos to five years in prison, and Adam Skelos to 6-1/2 years. Both have been free on bail. In overturning their convictions, the federal appeals court in Manhattan cited a Supreme Court decision that concerned former Virginia Governor Bob McDonnell, and which said routine activities such as arranging meetings were not a basis for corruption prosecutions. The appeals court also cited McDonnell last July when it overturned the November 2015 corruption conviction of Sheldon Silver, the former New York State Assembly speaker. Silver, a Democrat, was retried and found guilty on May 11. His sentencing is scheduled for July 27. New York Governor Andrew Cuomo, Silver and Dean Skelos once comprised the “three men in a room” who held enormous sway over legislation in the state capital of Albany. The Silver and Skelos prosecutions were among a series of corruption cases brought by Berman’s predecessor, Preet Bharara.